As an upgraded version of pH meter V1, this product greatly improves the precision and user experience. The onboard voltage regulator chip supports the wide voltage supply of 3.3~5.5V, which is compatible with 5V and 3.3V main control board. The output signal filtered by hardware has low jitter. 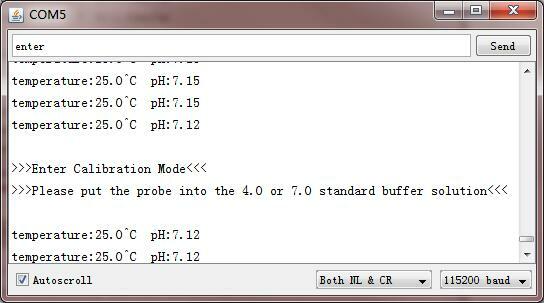 The software library adopts the two-point calibration method, and can automatically identify two standard buffer solutions( 4.0 and 7.0), so simple and convenient. With this product, main control board (such as Arduino) and the software library, you can quickly build the pH meter, plug and play, no soldering. 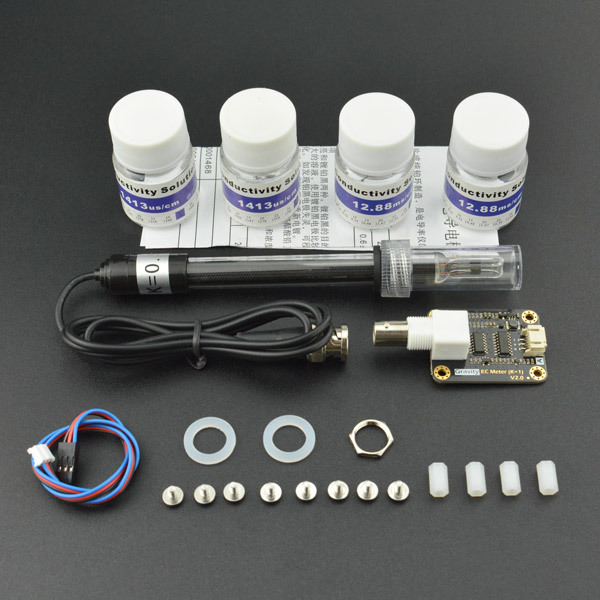 DFRobot provides a variety of water quality sensor products, uniform size and interface, not only meet the needs of various water quality testing but also suitable for the DIY of multi-parameter water quality tester. This tutorial will demonstrate how to use this pH meter for calibration and measurement. Please read each step carefully. Before measuring another solution, be sure to wash the probe and absorb residual water-drops with paper to prevent cross-contamination between solutions. The probe can be washed with distilled water. Before using the pH probe, pull out the probe from the protective cap, then wire as shown below. After completing measurement, clean the probe, then insert it into the protective cap. To ensure accuracy, the probe used for the first time, or used for a period of time, needs to be calibrated. This tutorial uses two-point calibration and therefore requires standard buffer solutions of 4.0 and 7.0. The following steps show how to operate two-point calibration. 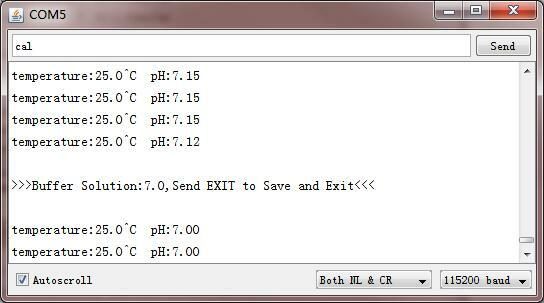 1.Upload the sample code to the Arduino board, then open the serial monitor, you can see the temperature and pH. If you added a temperature sensor, be sure to write the corresponding function and call it. 2.Wash the probe with distilled water, then absorb the residual water-drops with paper. Insert the pH probe into the standard buffer solution of 7.0, stir gently, until the values are stable. 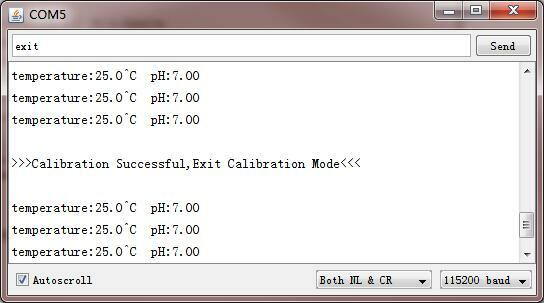 2.Input CAL commands in the serial monitor to start the calibration. The program will automatically identify two kinds of standard buffer solutions: 4.0 and 7.0. In this step, the standard buffer solution of 7.0 will be identified. 3. After the calibration, input EXIT command in the serial monitor to save the relevant parameters and exit the calibration mode. Note: Only after input EXIT command in the serial monitor can the relevant parameters be saved. 4. Wash the probe with distilled water, then absorb the residual water-drops with paper. Insert the pH probe into the standard buffer solution of 4.0, stir gently, until the values are stable. 2.Input CAL commands in the serial monitor to start the calibration. The program will automatically identify two kinds of standard buffer solutions: 4.0 and 7.0. In this step, the standard buffer solution of 4.0 will be identified. Please download DFRobot_PH Library first,then install it. How to install Libraries in Arduino IDE? Q1. How long does the probe need to be calibrated? A2. The calibration interval is determined by the frequency of use. Normally, you can calibrate it once a month. If used frequently, it can be calibrated once a week. When calibrating, fresh standard buffer solution is recommended. Q2. During the calibration, is it necessary to complete two points calibration? Can I complete only one point calibration? A2. In the case of low demand, you can use neutral standard buffer solution (7.0) for calibration, which is called single-point calibration and is used to confirm the actual zero point of the pH probe. At this point, the slope is the theoretical value. Then the actual slope of the pH probe can be confirmed by calibration with standard buffer solution (4.0) after signal-point calibration. Therefore, in order to ensure the measurement accuracy, it is recommended to use two-point calibration. Q3. What might be the reason for the first calibration that always fails to calibrate, or prints the unexception value? A3. When calibrating, the relevant parameters are stored in the specified position in EEPROM. If other data previously saved in the same position in EEPROM, there may be a conflict, resulting in an inability to calibrate properly. Use the following code to erase the contents in the specified position in EEPROM. Run it once, then upload the sample code again to restart the calibration. 1. When the probe is used for the first time or used for some time, the probe needs to be immersed in the 3NKCL solution for 8 hours. 2. Glass bubble in the head of the pH probe(in the plastic protection grid) shall not be contacted with the hard objects, and any breakage or rubbing will invalidate the probe. 3. When the measurement is finished, the protective cap should be put on, and a small amount of 3mol/L KCL solution should be put inside the protective cap to keep the glass bulb moist. 4. The plug of the pH probe must be kept clean and dry, absolutely prevent the output ends short-circuit, otherwise, it will result in inaccurate measurement or probe failure. 5. The probe should avoid long-term immersion in distilled water, protein, acid fluoride solution, and prevent contact with silicone oil. 6. After long-term use, if you found that the percentage of the theoretical slope of the probe (PTS) slightly reduced, you can soak the lower end of the probe in 4%HF (hydrofluoric acid) for 3-5 seconds, wash with distilled water, and then soak in the 0.1MOL/L HCL solution for a few hours, rinse clean with deionized. 7. The probes are passivated by the presence of contamination-sensitive bulbs in the solution under test or by the plugging of the liquid boundary. The phenomenon is that the theoretical slope (PTS) is reduced, the response time is long and the readings are unstable. Therefore, according to the nature of the contaminants, they should be cleaned with an appropriate solution to make them fresh. 8. Attention should be paid to the selection of the cleaning agent. The soluble polycarbonate cleaning liquid, such as carbon tetrachloride, trichloroethylene, four furans and so on, may stained glass ball bubble surface, and make the probe failure, please use these with great caution! 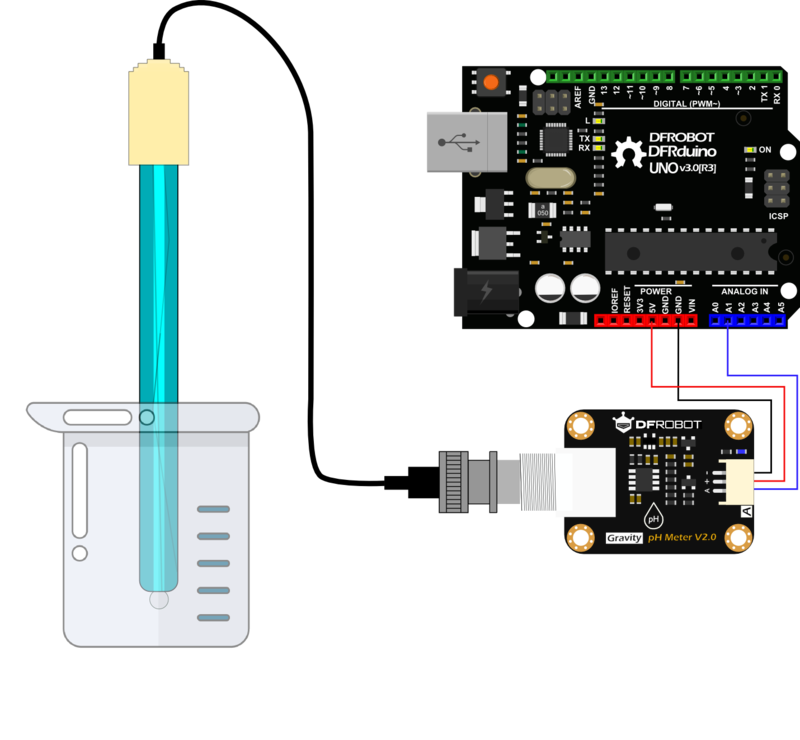 Get Gravity: Analog pH Sensor/Meter Kit from DFRobot Store or DFRobot Distributor.